The night began with the Unstable one himself, Dean Ambrose. He began to give his thoughts on the Fatal four way match on Sunday and his thoughts on the other three men in the match with him. When he came to Roman Reigns, Ambrose began to explain his actions but was cut off by the Powerhouse. Reigns entered the ring and Ambrose made sure that Roman knew he wasn’t going to get an apology as he was in the moment on Monday and Roman knows what he’s like when things get a bit crazy. Roman indeed understood and said he hoped that Dean brought every bit of that fight with him to Payback because he was going to be bringing it right back. The two agreed that they were tight that night but at Payback it was every man for himself. Roman offered his hand to Dean but before he could take it, Kane came out to interrupt the bromance. The Corporate Demon informed Dean that he would see action against the Celtic Wrrior in a match that began right now! 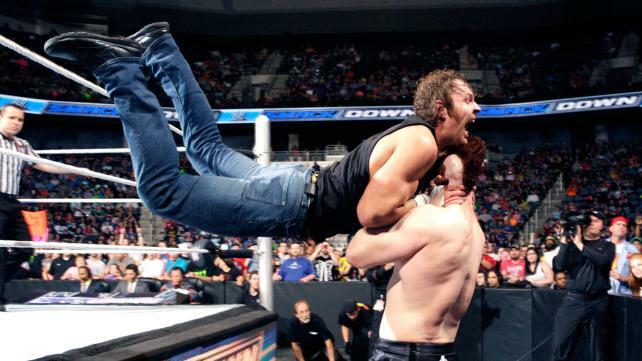 Dean Ambrose was rearing to go as soon as Sheamus entered the ring. The fight never slowed down as the two battered each other with everything they had.. Every time Sheamus had a slight advantage, Ambrose would scratch and claw his way out of every predicament and land viscous blows to the pale Warrior. Both men were simply ruthless in their attacks and Ambrose threw caution to the wind on more than one occasion as he completed moves like his suicide dive and his rebound clothes line. Sheamus was no slouch either as he used his strength advantage on the Lunatic Fringe that had the former US Champion reeling. It looked like Sheamus would put away Ambrose as he hoisted him up on his shoulder to while perched on the top rope to possibly deliver White Noise to the floor. But somehow Ambrose wriggled out of it and Sheamus conked his head on the turn buckle. Dean capitalized on the dazed Celtic Warrior and rolled him up for a pinfall victory. This match was awesome. Ambrose was on fire against an opponent that brought the fight right back to him. Sheamus’ brawling powerful style meshed extremely well with the more eccentric unorthodox style that Ambrose has made his own. He by far has the most momentum of the three challengers heading into the Fatal Four Way match at Payback. Bout time Lana took responsibility for her actions. Just saying, Rusev needs his manager now more than ever and with her head filled with American corruption how is she supposed to aid her charge. Sure as an American, I get it. Our ways are different than theirs. Just because they are a judgmental group doesn’t mean that we have a right to influence the poor innocent Russian manager. I will also say that Rusev’s video loop of John Cena saying I quit repeatedly made me giggle alot more than I’m sure it should have. Kane’s jealousy strikes again as he set up the match between WWE World Heavy Weight Champion, Seth Rollins and Ryback. Before the match, our beloved champion addressed the WWE Universe. He aired his grievances against Kane’s inaction on Monday night but assured those of us who bought in, that he would emerge victorious at Payback. He began to address his opponent but Ryback cut him short. As the Big Guy made his way down to the ring, Bray Wyatt struck from out of no where. And as quickly as he appeared, he was gone! The match continued any way with Ryback never really able to get his head in the game to capitalize on the powerful moves he was able to hit. Seth, smelling blood in the water, kept his attacks strong and fast. Yes, occasionally Ryback was able to land his signature moves, but the resilience of the champion and two Avada Kedavras (Super Kick to a kneeling opponent) later and Ryback was pinned 1, 2,3. So proud of Seth for rising up against adversity. Clearly Kane is out to get the champion in an effort to seem relevant. But Rollins is too talented to let such pettiness keep him from excelling. Ryback was but a speed bump on the road to retention at Payback. Seth is riding high on the wave of momentum and I have every bit of faith that he will emerge victorious on Sunday night. Tyson Kidd and Kofi Kingston locked up in singles competition just days before the 2 out of 3 falls match that would determine the WWE Tag Team Champions. The two smaller wrestlers used their skills against one another in an even match up to try and eek out any momentum they could. Both used their agility and speed in an effort to gain the win, but in the end it was the Sharpshooter that gained the victory for one half of the Fact Droppers. Speed and agility may well be what makes the match on Sunday. Sure power is important, but if you are faster than your oponent then by all means, you chould be able to avoid their strikes and hit them with your own. This match was a show case of what the two high fliers of their teams can do in the ring and against one another. It was a pretty even bout that just happened to not swing in Kofi’s favors. Will it be the same story on Sunday? Maybe, but Cesaro and Tyson would have to get lucky twice to get those titles back. The inspirational Bo Dallas walked the WWE universe through the 5 stages of grief at the loss of its Goat as only he can. And then he had a match with Neville. It was short and sweet and King Barrett was on commentary as it took place. Dallas got in a few offensive moves but ultimately he was no match for the man that gravity forgot as one Red Arrow, and Bo was out like a light for the three count. After the match our King addressed his Payback opponent. He promised that Neville would be the recipient of a royal Bull Hammer on Sunday and that he, the King, would emerge victorious after beating some sense into the commoner. I almost felt sorry for Bo. But I guess he needs to Bo-Lieve in himself more. I do feel better about Daniel Bryan leaving after Bo’s help though. Laughter is good for the soul, and laughing at all those sad sad troll lovers’ loss of their beloved B+ Player was a very healing experience. And then on top of it I got to see Neville do what he does best and destroy someone with the work of art that is his offense? Well, yep it was a good night indeed. 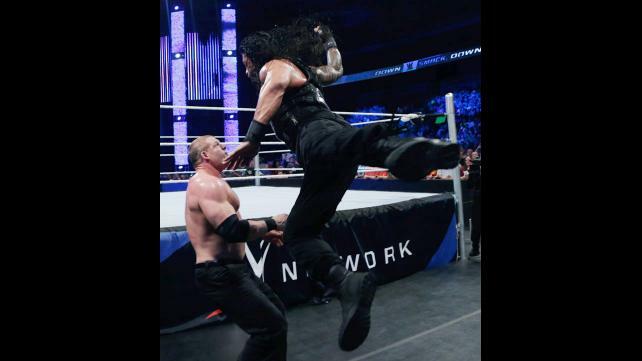 Roman Reigns and Kane picked up exactly where they left off Monday night. It was a brutal beat down that involved weapons soon after the bell rang. Roman ended up wailing on Kane with a Kendo stick like he was swinging for the fences. The Corporate Demon turned the tides and took control and returned the favor on the Big Dog. But wood was not the only thing utilized, but the steel steps and wooden tables also made their appearances with Reigns being put through one of them but kicking out before the three count. Roman won the match by Superman punching and then spearing Kane through a table that had been set up in the corner. Who is ready for the Championship match at Payback? Roman Reigns is. Not much can be said about the match itself. It was decent and alot of fun, as slobber knockers tend to be. But the real fun happened after wards as we saw our beloved Champion watching the match back stage with J & J Security in tow. And who should pop up behind him? Why Dean Ambrose with a tray full of cookies. He was kind enough to offer one before he attacked the Savior of the WWE, but he was a tad overwhelmed by the awesome twosome of Jamie Noble and Joey Mercury paired with the superior abilities of Seth Rollins. But Roman had to come back and ruin the fun. 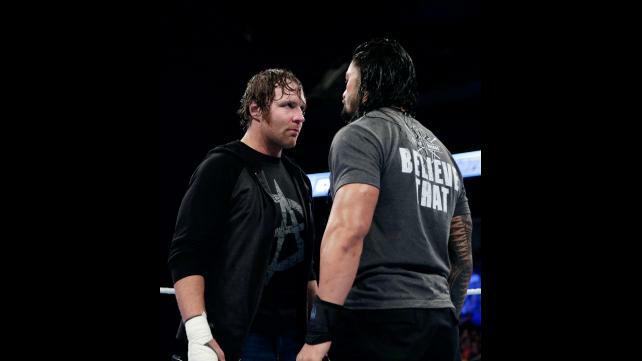 In the end Both Dean and Roman stood face to face. Once again, Reigns offered his hand, but Ambrose teased the hand shake but bent down to pick up the WWE World Heavyweight Title belt. He placed it on Roman’s shoulder and told him not to worry, because he would be back on Sunday to get it back from him. WWE: Smackdown 5/8/15 Recap!!! Fatal Four Way Contract Signing!! WWE: Payback Recap!! It’s What’s Best For Business!! This entry was posted on Saturday, May 16th, 2015 at 1:10 am	and is filed under Events, News, Television. You can follow any responses to this entry through the RSS 2.0 feed. You can skip to the end and leave a response. Pinging is currently not allowed. « Kate Beckinsale Returns For ‘Underworld: Next Generation’!! !